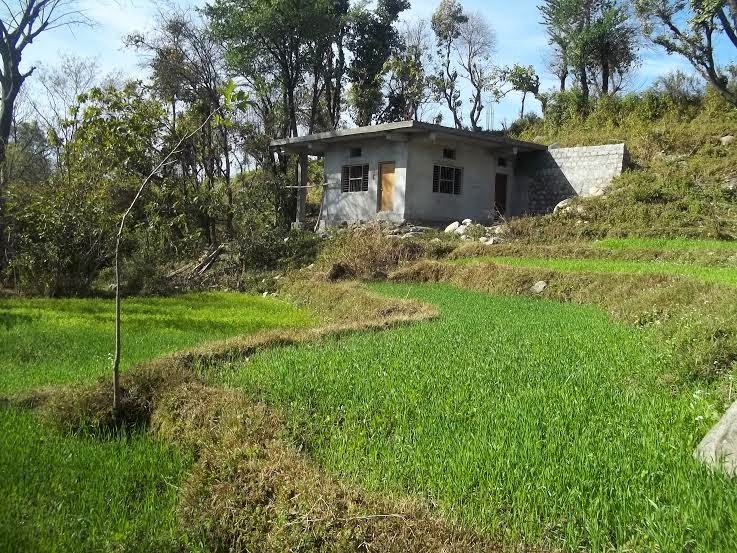 This land situated at Dari village at an altitude of about 1100 meter near Dharamshala, Himachal Pradesh. I had a fascination for nature and a dream of building some nest / huts for saints; writers; painters; friends and for thyself for the last many years so as to rejuvenate ourself by living close to nature and mountains; gazing stars in the night; learning yoga ; dhyan and meditation. The view of the Dhaula Dhar Mountains during full moon Night is mind blowing. As i had been born and brought up in the metro city - Delhi - the heart of India. I had fascination and love for my city Delhi which i had seen grown up as i grew up their. Though the capital of India Delhi -- had changed tremendously from a slow and sleepy city during the fifties to the modern and one of the thickly populated city with metros; flyover; traffic jams; warm and dry weather during summers and cold and dull weather during the winters. The history of this city is fascinating and interesting. 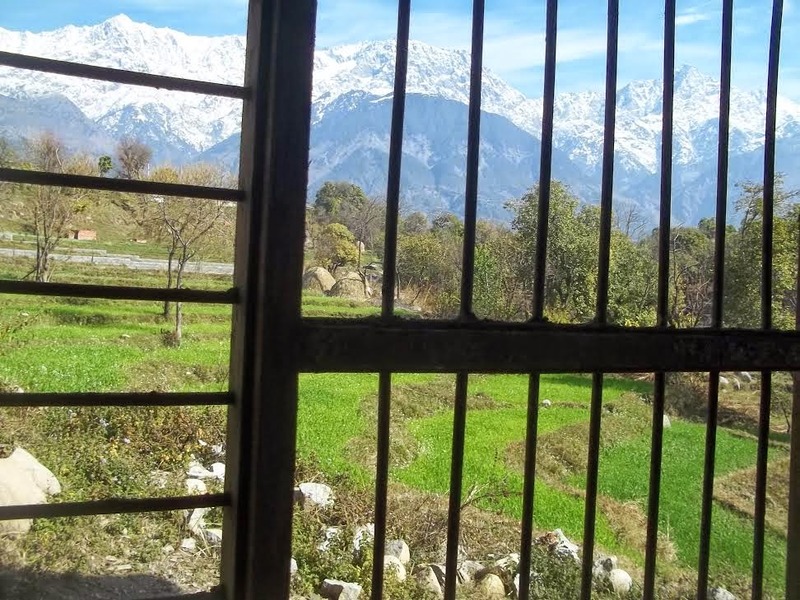 During month of March 2014 i visited Dharamshala with one of my friend and then decided to built up a small hut project on this land situated at Dari village, near Dharamshala, Himachal Pradesh. The Dharamshala town is just 3 to 5 kms away from here and the Mecleodganj the abode of HH Dalai Lama is just 15 kms away from here. One can reach Dharamshala by local bus (quite frequent) by paying just Rs.5/- and can reach Dharamshala Bus stand and Kotwali Bazar. The Norbulingka Institute, founded in 1988 by Kelsang and Kim Yeshi at Sidhpur, near Dharamshala, India, is dedicated to the preservation of the Tibetan culture in its literary and artistic forms is also quite near by from this site (5 kms). To built a hut is a difficult task in this area but i determined to built one no matter what trouble or difficulties might come on the way for building my dream project here. The local stone cutter were contacted to cut the stone which is in abundance in this land to be used for construction for huts. The work on stone cutting was started on 18th March, 2014 and it was agreed to cut around 2000 to 4000 pieces of stone brick size within one months time. It was during the month of April 13 that I came to this place with an aim of building a small hut or may be a room on this location site within 15 to 20 days time frame or may be maximum of one month to complete this project of one room / hut. By this time around 2000 pieces of stone were cut by the stone cutter labourers who are the traditional stone cutter from this area and are expert in cutting such types of hard rocks which are lying in abundance. The location for construction of the room /hut is decided which is to be on the south western part of the plot. As this part of the site is sloppy one and it needs to be levelled by digging. So the Rajasthani labours contacted and they started the work of digging and levelling of land on 17th April, 2014. Day by day lots of rocks ; stone were coming out of digging and it took my massive 12 days of digging and levelling for this plot and the site is filled with lots of rocks and stone. The stone cutter were cutting the stone/ rocks doing blasting in a traditional way and cutting further stones which is to be used for construction of the stone wall so as to stop the small hill to be fallen further. Now the big challenge before me was how to use this massive rocks; stone out of this site and clear it for construction of room and by now the idea of building a small hut of the size 12x 12 10 feet long is over and i started thinking of building a room of the size 12x 12 x 10 or even bigger and finally it was decided to build a room of the size 16'x16'x11' along with attached bathroom; but before construction of the room i had to make a massive stone wall so as to stop the hill getting down during the raining season. So it was decided to first construct the Dangga (support wall for the hill) to be constructed first before we make a room set. The work on this stone wall was started on 28 April, 2014 with two Masons and five labourers. And it took another 15 days to construct this stone wall which is 42' long and about 14' high. And about 2600 pieces of stone were used for construction of this wall. The foundation of the first pillar was laid on the Buddha Purnima day i.e 14th May, 2014 and a small pujja was performed in the morning between 8AM to 9-00 AM. Blessing is sought from Sai Baba; Guruji and Avdhood Saint. On this day first two iron pillars were erected and later on six pillars following along with seventh to be added later on. So work on the construction of room started in a hope that this place is going to be developed within next six months time. A proposal is under way to make few rooms along with attached bath on this site and side by side to construct few huts made in the traditional way by using stone and mud for the saints; yogis and writers etc. who can come over here and stay - enjoy the organic meals; and enjoy the nature as well. Finally the roof is made over this room on 6th July, 2014. The work is still under progress and hope it will be completed soon by December 2014 so that when you visit Dharamshala , Himachal Pradesh you can stay over here in the near future and enjoy your stay like HOME STAY -- at SAINT RETREAT. Local river nearby the site - just at walking distance. Home. Birds are welcome... Ready to use soon..